How do you choose an Architect? At the beginning of the year the trustees approached the Royal Institute of British Architects to seek advice about how best to hold an architectural competition. Our initial intent was to invite entries from around the world so that we would be sharing this project with all those who work in the visual arts. 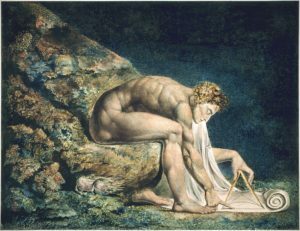 It would be a brave person who dared separate image from imagination, and so we believed we might receive some extraordinary entries from young architects across the globe who see Blake as the unacknowledged patron of the imaginative arts. However a number of considerations began to dampen this idea. Firstly, the cost might be far in excess of £50k; secondly, an understanding of Blake requires an extraordinary depth of understanding and any briefing worth its salt would be difficult to provide to those across the seas; and finally there was our concern with how the reception of innovative ideas would be received in the village. Felpham is an old village; it appears in the Domesday Book and the area immediately around the Cottage is a designated conservation zone. So we changed track and set about researching a list of practices that were experienced in renovating historic buildings yet caught our eye with their imaginative solutions. We were seeking an architect who could pare back the accretions that have been added to the building over two centuries to reveal the Cottage that Blake would have known and loved. In the liberated space we could then create a multipurpose building that would expand our curatorial boundaries and be an architectural jewel to draw people to the village in its own right. From this shortlist we whittled down the names to four architectural firms whom we invited to visit the Cottage. One by one we showed them around the village, house & garden and conversed with them over coffee by the ocean. It is always a delight to walk around a building with an architect – they see things that are denied to the rest of us. As one of the finalists observed: in appointing an architect you are trusting a person to take you places you would never imagine. The appointment will be formally announced in September. The Trust had the Cottage surveyed before we exchanged contracts with the owners which included an inspection from a specialist thatcher. In consequence we negotiated down the price of the Cottage from £520k to £495k. Degradation of the roof has continued and in the Spring we commissioned a report from a specialist firm of structural engineers who are expert in historic buildings. The report arrived in April 2016 and in July we received permission from the Principal Conservation Officer of Arun District Council to erect temporary steel supports within this Grade II* listed building. We have obtained a quotation from a local builder in Bognor Regis and the cost for the work and the hire for keeping the steel supports in place for up to a year comes to £4,800 including VAT. 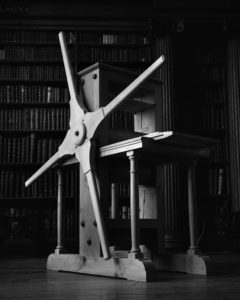 The wooden rolling press that Blake owned is now lost, and with the advent of cast iron all the wooden presses disappeared, however Michael Phillips has researched and rebuilt a replica of Blake’s own press that is now on display in the library of Christ’s College, Oxford. As part of the renovation project we will be re-thatching the Cottage and restoring Blake’s ‘roof of rusted gold’, as he once wrote in a letter from the village of Felpham to a friend in London – or was he sleeping under a sheep?